It’s December. There may be snow where you live. It’s the month when we celebrate Christmas. Christmas is a wonderful time for thinking of others. It’s a time when we give and receive gifts. I love giving gifts. Do you? At this time of year, we hear stories of elves, reindeer, and Santa Claus. Some of us make crafts with snowflakes, candy canes, pinecones, gingerbread men, and other fun stuff. It is a pleasure to bake cookies, pies, breads, and cakes, and it makes the house smell lovely. It’s a time when we drink hot cocoa and cider. Some of us send out Christmas cards. Many of us follow traditions and make memories. What are some of the traditions you do in your home? Christmas is my favorite holiday. I love everything about it. One thing I keep alive is the real meaning of Christmas. Over the next few lessons, I will tell the story of Christmas. You may already know this, or this may be new to you, but the story doesn’t start in the stable. There is more to it than shepherds, a manger, star, and the three wise men. The story starts with an angel. Gabriel is a special angel God sent to announce the birth of two babies. Zacharias was a priest for the Lord in the temple in Jerusalem. 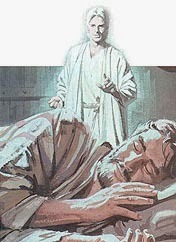 While Zacharias was all alone in the Temple, burning incense to the Lord, Gabriel appeared to him. Zacharias was afraid. He had never seen an angel. I would be afraid too. Gabriel said, “Do not be afraid. Zacharias, for your prayer is heard; and your wife will bear you a son, and you will call his name John.” Luke 11:13. God sent Gabriel to Zacharias to tell him that not only were he and his wife Elizabeth going to have a baby, but that baby would tell people about Jesus, the promised Messiah. 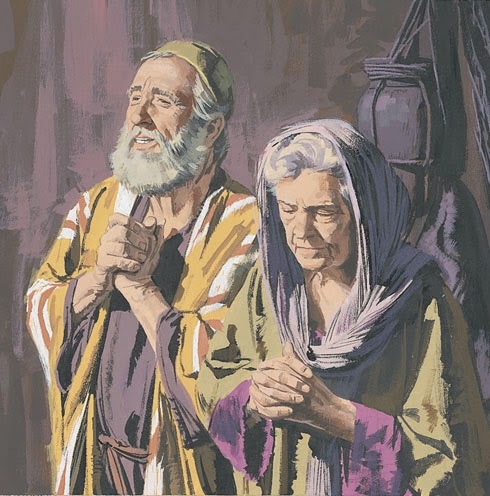 Zacharias and Elizabeth had no children and were praying for years to have one. It was wonderful news, but Zacharias didn’t believe the angel. 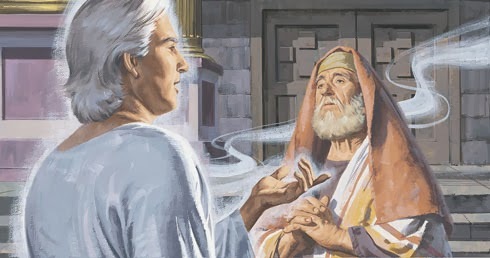 Because of this unbelief, God made Zacharias speechless. He was unable to speak until the birth of his son John. People were amazed that he came out of the temple dumb, not able to speak. He had to write what he wanted to say. I think he learned his lesson, and if an angel came again, he would believe that angel. You can read more of the story in Luke 1:5-23, 39-46, and 57-80. 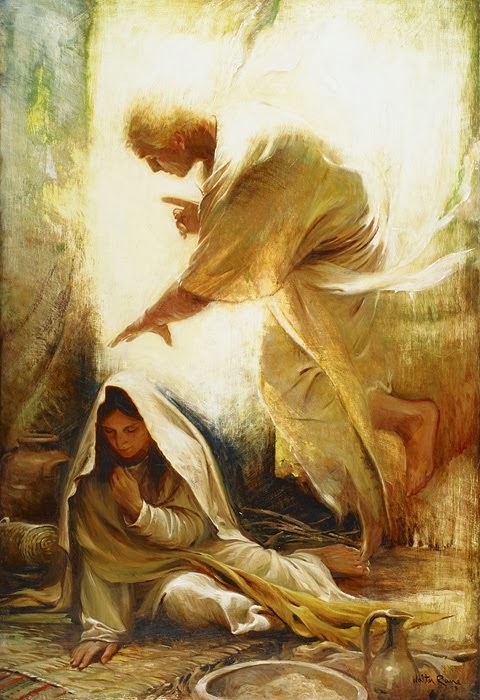 Gabriel also appeared to a young woman named Mary. She wasn’t a wealthy girl or a leader in her town. She was an ordinary girl who loved her Lord with all her heart. Mary wasn’t expecting a visit from the angel. Then Mary said, “Behold the maidservant of the Lord! Let it be to me according to you word.” Luke 1:38. Then the Angel left. Can you imagine getting such news? I would have been afraid of the angel and astonished at what he said. Mary wanted to see Elizabeth her cousin, so she went for a visit. You can read about it in Luke 1:39-56. Some of these events were recorded earlier in the Bible. God told his prophets in the Old Testament what was to going to happen many hundreds of years in the future, and they wrote it down. This is called prophesy. Isaiah was one of those prophets. Behold, the virgin shall conceive and bear a Son, and shall call His name Immanuel. Isaiah 7:14. Also, 9: 6 says, For unto us a Child is born, Unto us a Son is given; And the government will be upon His shoulder. And His name will be called Wonderful, Counselor, Mighty God, Everlasting Father, Prince of Peace. Micah was also a prophet who wrote about Jesus. Many Old Testament books tell about Jesus and what would happen to him. In our next lesson, I’ll tell you more about the events leading up to Jesus' birth. The birth of Jesus is exciting and I can’t wait to tell you that part in our next lesson. Please take time to write to me, and don’t forget to memorize this verse: Isaiah 7:14 Behold, the virgin shall conceive and bear a Son, and shall call His name Immanuel.